Days of Our Lives: Week Long Wedding Event, Day 4: Marlena and John Give Us Soap Gold . . . That's a Fact! Let&apos;s just get right into Day 4! Steve has his patch back. He&apos;s giving John the business about the eye makeup that Valerie and her sleeves put on him yesterday. Eric and Brady join in the business giving. I love this scene because all the men are just back to hanging out and ribbing each other, and just living their best cuddle buddy lives. Eve is now giving Jennifer the business about the flowers. Jennifer gives it back by telling Eve she is wearing white at a wedding! Eve blows Jennifer off by telling her what any good Horton should know, "For your information, it&apos;s PEARL." These two are not living their best cuddle buddy lives, but they are giving me rivalry realness! Abe says Marlena is missing! Foreboding music follows as we see Susan. She&apos;s humming the wedding song and pulling the knife out of Marbie&apos;s back . . . just as Will walks in. Will asks if everything is okay. Why wouldn&apos;t everything be okay? . . . at a wedding? . . . in Salem? . . . featuring John and Marlena? Will is being the perfect gentleman as he offers to be Susan&apos;s plus one for the WEEK LONG WEDDING EVENT #DAYS #ShootTheBride . . . Sorry, I got carried away. Thank goodness VALERIE&apos;s GREEN SLEEVES ARE BACK TO GRAB MY ATTENTION! Here comes Claire Bear retrieving those cell phones because Grandma Marlena wants to control the postings on the social media. Cut to Paul and Will, and all of the Horita sweet preciousness . . . cut to Sonny having a flashback of a very different looking Will at the WilSon wedding. Let&apos;s not spend too much time on that precious memory because Claire Bear is singing as Kayla skulks down the aisle. Really, Kayla? Really? At the altar is the time to tell Bionic Patch that you&apos;ve been keeping secrets? Of course it is. It&apos;s a Carlivati-constructed wedding event. All of the people must be doing all of the things in a wonderfully soapy way! Yes, I am gushing! It&apos;s Dr. Marlena Evans walking down the world&apos;s smallest aisle with her beloved Eric and much less beloved Brady. Marlena is sorry she&apos;s late, while Horita hand holds, and Sonny is bitter about Leo&apos;s blood stain on the mantle. But, let&apos;s get back to the wedding where Abe is presiding, Susan is nose-blowing, and Horita is hand holding and giggling. Here comes young William to read a sonnet since he can&apos;t recount memories he no longer has . . . yet. While young William is reading the sonnet, let me say that I LOVE a full house for a wedding. Every time I see a half empty wedding set, I holler at my screen about why folks can&apos;t hire some extras. A full house is a must for a soap opera event - Back to the show . . .
Will is talking about how he can&apos;t remember much stuff. That means he has to live in the present and we should celebrate the love that is in the present - cut to a big ole smile on Paul&apos;s face. Here comes Sonny, bellying up to the bar at the Brady Pub with Roman - who is also living in the past by not attending to Jarlena&apos;s wedding. Bitter, party of two, your table is ready! Lord in the mornin&apos;, here comes Will&apos;s memories all flooding back right in the middle of Grandma Marlena&apos;s WEEK LONG WEDDING EVENT! Paul is heading up to the altar to say his peace about the Jarlena wedding, but notices Will looks a little cockeyed and wants to make sure he is okay. Oh well . . . in the words of Marlena, "What could go wrong?" Will is freaking out and all up in his feelings in the square with a lot of sparkling lights. It seems that the serum must have been an extended release version. It took a minute . . . Here come the vows . . . "The Queen" Deidre Hall is giving classic, leading lady realness. THIS. THIS is why our grandmamas and our mamas watched their stories, and why we continue to watch them. I am GLUED to my screen. I had to scroll back to rewatch the scene so I could blog about it. These vows and the way Dee and Drake Hogestyn play off of one another is just simply gold. GOLD! And just when you think those vows are a stand alone scene, we cut to Will recalling more and more about his wedding to Sonny. He&apos;s remembering the love that caused him to, in the words of Marlena, "take a leap". Now Sonny is talking to his wedding picture at the Brady Pub about how Will brought him "the adventure of his life". The pace of these scenes as we go from John and Marlena&apos;s wedding, to Will regaining his memory of Sonny, to Sonny grieving for the love he once had. Damn . . . THIS. IS. SOAP. OPERA! John&apos;s vows are just as tear-inducing as Marlena&apos;s. He thinks of her even when he is going around the world being John Black in Alamania, and Melaswen, and such places. Then, here comes Will remembering all of his WilSon wedding memories, in all of their re-imagined brilliance. Chandler Massey is giving damn good face in these scenes - three Emmys, y&apos;all . . . and there is the wedding picture Sonny ripped up . . . and back to John&apos;s vows. Marlena had better get used to being stuck with John Black. John will always be "mad about [Doc]. That&apos;s a fact!" Y&apos;all, I&apos;m in tears. TEARS! Side note: Eve with her head on Brady&apos;s shoulder, with Paul behind them smiling (poor, Paul). The detail in these scenes is just amazing. Abe clears his throat as it is time to stop this foolishness and get on with these proceedings. He states the traditional wedding vows, "and with this ring, I thee wed." Again! In the park, Will is crying and thinking he should get back inside, but the memories just keep on coming. These re-shot scenes of Will and Sonny&apos;s wedding are stunning. OMG. It&apos;s Sonny! I&apos;m not even a WilSon fan. I&apos;m Team Horita all the way, but I&apos;m still crying. Back to the wedding! Did Abe Carver&apos;s voice just break as he was . . . It&apos;s Sami just being Sami all over the floor of that tiny aisle pleading to her mama that she can&apos;t marry John! Annnnnd, SCENE! Just when you think it can&apos;t get much better than Wednesday, here comes Thursday to remind you to keep watching. Wow. Just, wow. Can it get any better on Friday? I&apos;m guessing it SO can. DAYS' Week Long Wedding Event, Day One: Cin & Bonnie & "Marbie", Oh My! 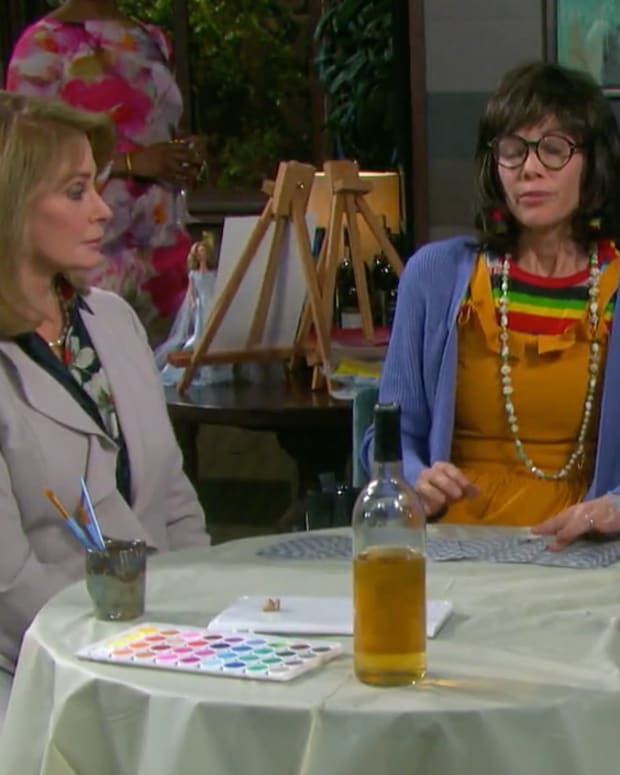 DAYS Week Long Wedding Event, Day 2: Susan Returns and Jennifer Paints a Self-Portrait! DAYS Recap: John Doesn't Understand Why Belle "Wants to Kill" Marlena! DAYS Week Long Wedding Event, Day 5: Kristen and Sami Go All Kristen and Sami!